This PA Permit Test, with multiple choice questions, is intended to help you prepare for the PA Drivers Test written knowledge test that is required before you can get your driver’s license. Passing the PA permit test is as easy as 1 2 3 using our online interactive driving practice tests with high-quality images. Study for this driver’s license practice test is completely free. The Knowledge Test will measure your knowledge of traffic signs, Pennsylvania’s driving laws and safe driving practices. The Knowledge Test can be given in oral form and in Spanish, upon request, at all Driver License Centers across the commonwealth. If you fail the Knowledge Test, you will be permitted to retake the test the following business day. Before you take the Permit Test, you can take our practice tests. These tests include everything you will need to know for the real test. Practicing and studying the questions and answers are the keys to passing the DMV Test. Take our eight free practice tests now. Take a couple of the FREE practice tests for the written driving test. We offer the practice tests in both English and Spanish. Pass the first time by taking our FREE PA permit test. We offer the practice tests in both English and Spanish. Pass the first time by taking our free PA driving test. 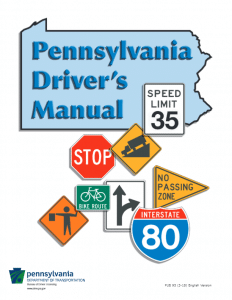 Over 200 question and answers are taken from official PA driver’s manual. Pass the first time by taking our FREE practice test. Over 200 questions with images taken from official driver manual. Prepare for your permit test with our practice PenDot driving test. Gain access to 100s of practice questions and pass your permit test the first time! Free online written driving test for Pennsylvania. Online permit test software for learner’s permit driver knowledge test. The DMV can be a scary place. The wait can be long, the employees aren’t always friendly (everybody has a bad day now and then) and the nervous energy in the room is palpable. Every day, new drivers are getting ready to take the PA Permit Test, hoping desperately not to fail and start from square one. Don’t be one of those new drivers! Your DMV experience doesn’t have to be scary or even ruin your day. The single biggest key to bucking the trend is one word: preparation. If you’ve taken any tests recently, you know how important it is to study in order to succeed. But it also has a significant impact on your mindset: if you feel well-prepared, you’ll be more focused and ready for the challenges ahead. So how do you accomplish that feat when looking to get your driver’s permit in Pennsylvania? By taking one of more of our FREE practice tests. If you are unsure about any of PA’s traffic laws, from speed limits to road signs and right-of-way rules, we’ll be happy to alleviate those concerns. Our practice tests cover all eventualities, allowing you to go into the test confidently and ready to succeed. And before you know it, you’ll hold that coveted permit in your own hands! Then it’s time to start driving, which is when the true benefit of our practice tests comes into play: no matter what you encounter on the road, you’ll know how to act. Questions? No problem! Contact us and we’ll be glad to help. This test needs to be successfully completed before you can receive a valid learner’s permit. You must obtain a learner’s permit before you operate a motor vehicle in Pennsylvania. You will need to take and pass the Vision, Knowledge and Road Tests to get your driver’s license.